Discussion in 'Mobile Tips/Plans and Internet Discussions' started by yomitech.com, Oct 28, 2016. Even though the mtn 4g network coverage is not yet available in all cities in the country, Mtn is actually looking for ways to encourage its customers to swap their old sim for the new 4g LTE sim card. 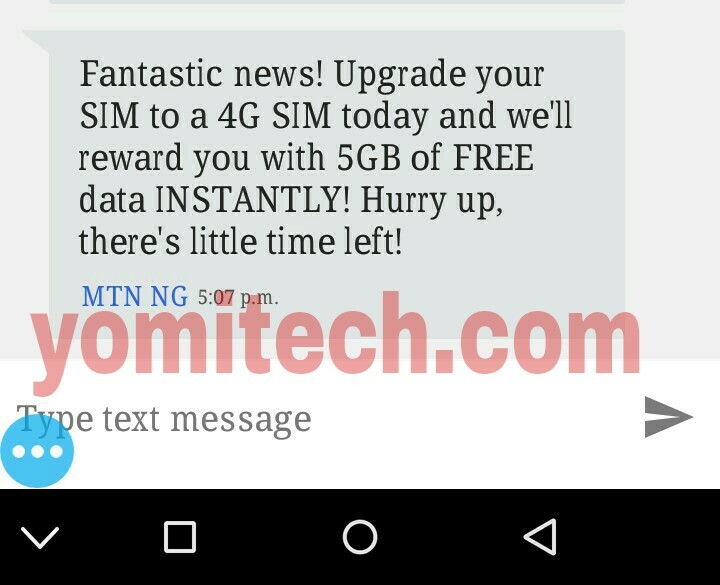 MTN is now giving out free 5gb data when you upgrade your Mtn sim card to 4g sim. 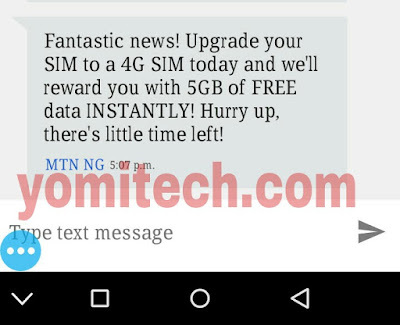 This new offer from MTN is available to all its customers. All you have to do is to make sure you have a compatible 4g smartphone and a Mtn 4g sim card, then you are good to go. The data can be used to browse, stream videos and music, download or do any other thing at all. => First make sure you have a 4g LTE smartphone that supports Band 7 (2600MHz) => You can also confirm by sending 4g to 131. If your phone is compatible then you will get a message just like the one below. => If you get that message, then you are good to go. => Just visit any Mtn experience center to upgrade your Sim to the 4g sim card. => After that, insert the new sim into your 4g smartphone and you are good to go. => Dial *131*4# to check your free data. To check if your smartphone will work or not then click on this link. Did you just read this now, and have already gone to MTN office and done the upgrade before spurting out that it doesn't work? its *559*62# to check free data, and its 5gig for 7days only. and lastly, it also works on 3g enabled phones. Glo N 0.00 kb is browsing perfectly on latest SynphonShield v3.1.3 and I will show you the settings so that you enjoy it too. SynphonShield is one of the popular VPN apps used for tweaking and changing location or hiding identity while surfing the internet. I guess you have known this before now. Good!!! Let's get to the main point we are here. HOW TO BROWSE FREE WITH N0.00KB ON GLO USING SYPHONSHIELD VPN. 3. Download the syphonshield app here. Remember that you must be on Glo Pay As You Go (PAYU) plan, if you are not yet on the plan, kindly text PAYU to127. Once you have received a reply that"you are using data Pay As You Go to browse, that means you have successfully activate it. After that, select save and click on “tunnel whole device”. Don’t tick connect through HTTP Proxy. Then wait for few seconds for it to Connect.Within few seconds, it will connect and you should be able to browse and download as you like.